Bibles Tracing Fun helps teach children, ages 3 and up, important biblical truths as they develop fine motor skills needed for school success. Also included is a dry-erase marker and an engaging music CD that reinforces inspiring scripture passages plus teaches fun Bible songs. 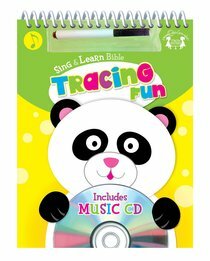 About "Sing and Learn: Bible Tracing Fun Wipe-Clean Workbook & CD W/Marker"